The barcelona chair mirrors the simplicity of its origin – the Barcelona Pavilion – with simple shapes, straight lines and big attention for detail. After the exposition in 1929 the Barcelona Chair appeared in many luxurious office buildings. The Barcelona Chair is still being made by hand today. Just the sewing of the pillows alone takes up 28 working hours. That’s one of the reasons why an original barcelona chair costs somewhere between 3000 and 6000 euros. The autograph from van der Rohe and Knoll’s logo are engraved into each original chair. Most shops don’t have original barcelona chairs in stock because of their high production costs. This is the reason why most people choose to have their Barcelona chair custom made, with colors and leather they choose themselves. 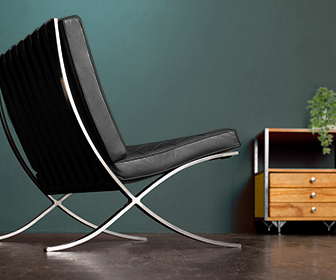 In Barcelona however there are some stores which have this chair from Ludwig Mies van der Rohe in stock. These stores often also have furniture similar to the chair, for example the ottomans or the sofa. Because the barcelona chair is often custom made, it is possible for you to choose the color and leather type that fit your interior best. When choosing the leather, keep in mind how often you’ll use this chair. People with children will greatly benefit from a durable type of leather. Let your supplier advice you on the maintenance of your Barcelona Chair. If you maintain the leather of your chair well, your chair will maintain in a good condition for longer. Besides the Barcelona chair and the Ottoman there are many more furniture pieces available in the Barcelona Collection, for example the Barcelona Table and the Barcelona Day bed. These were not designed by Mies van der Rohe, but were designed using the same principles: modern with simple lines, modern shapes and a lot of attention for detail. People who own a Barcelona chair know how big of an impact this piece of furniture can have on your home. If you can’t afford the real Barcelona Chair: there are many affordable replicas available. An authentic chair is hard to top, but the quality of some replicas is really close to the quality of the original. High quality replica’s can be found at for example BarcelonaChairShop.com. Buying an original or a replica Barcelona Chair will get you a beautiful unique designer chair which, if you maintain it well, will last you a lifetime. If you decide to purchase an authentic chair with Knoll, a small percentage of the profit will go to the Museum of Modern Art. Original Barcelona Chair or a replica? An authentic Barcelona Chair has a price starting at €6000,- euros. Buying an original chair could be seen as an investment. The chair will not lose value during the years. These days there are great Barcelona chair replica’s available. These are great quality-wise and a lot more affordable.